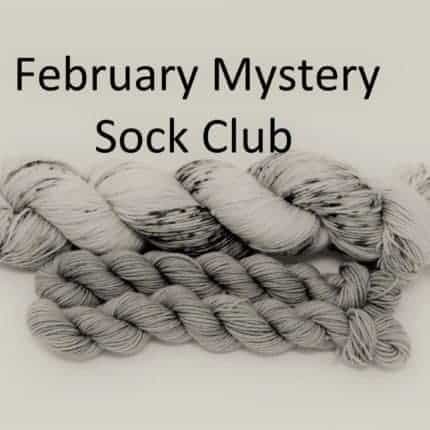 New to the shop is the February Mystery Sock Club. This club is intended for individuals who would like to add some excitement to their sock knitting. The colourway will remain a mystery until February 14th, however, there are some details that are public. This month’s kit will contain one full skein of MCN Sock Yarn (80% SW Merino, 10% Cashmere, 10% nylon), as well as two 15-gram mini skeins of the same base in a semisolid coordinating colourway. Two mini skeins (as opposed to one large one) allow the knitter to visually gauge how much they would like to allot to the cuff, heel and toe per sock without needing a scale to weigh! The full skein is 380 yards and 115 grams, and each mini is approximately 60 yards and 15 grams. This listing is ready to ship and purchases made will be mailed out either same day or next day. Yarn will be unskeined, but tied in four separate places to ensure it doesn’t tangle, and vacuum sealed flat to ship. Shipping within Canada is a flat rate of $10 CDN and shipping to the United States is a flat rate of $11 CDN. Please see the listing information for International shipping, or contact me directly.